10” in total length and approximately 8.5” in circumference. 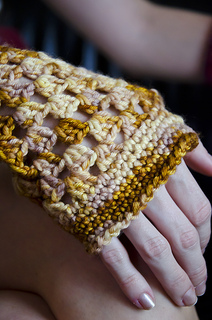 The yellow and gold colorways of Unplanned Peacock’s SW Merino DK and unique construction update the look of these classic fingerless mitts, worked from the rosette out with single crochet stitches picked up on both ends. 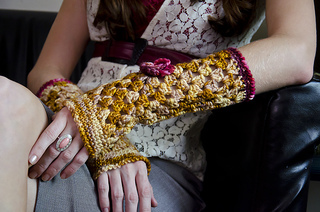 Fingerless mitts are worked in the round from the center flower out. To change the circumference simply add or subtract rounds.